Tricolor Beech is March 2019 Plant of the Month – Glacier View Landscape and Design, Inc.
Tricolor Beech or Fagus sylvatica ‘Purpurea Tricolor’ is a fabulous multicolored medium sized shade tree that will add show stopping color to any landscape. 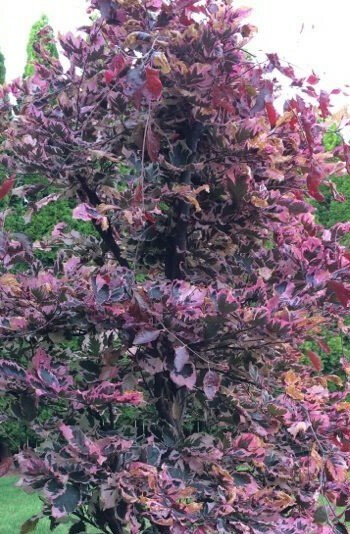 It has an unusual marbled color with cream, silver, and pink/burgundy leaves that start out purple in the spring. This vividly colored tree was introduced in France in 1888, and is related to the copper Beech. It likes moist, well drained soils, full sun to part shade, and is hardy to -30F. This is a great patio tree. Sit and stare at it and be amazed by the colors. The flowers are nothing special, the shape is nothing special, the size is nothing special, the bark is not that attractive. But the colors…they go on and on. Find a special spot for one where it can be seen. Amend the soil well and enjoy the relatively rapid growth in our Broomfield Colorado landscapes. Beech are relatively disease free in Colorado. If stressed, they can be susceptible to borers, but not often. There is an unknown disease in the eastern US but it has not spread to Colorado. Our drier climate would probably prohibit it from making it here. In general, they are easy trees to care for. Be bold, plant one for the color!